I submitted two grant applications in the last few months. I’m not as brave as some, including Titus Brown, who put their applications on their blogs, I thought I’d share the word clouds associated with each application. I like word clouds, mainly because I like words and this presents them in a potentially meaningful light. I’m not sure exactly what they’re telling me. Sometimes I think this is how Sherlock sees things and then uses some Bayesian process or hidden Markov model to reconstruct the underlying text. I do find them useful to ensure that I haven’t used too many of those sentence adverbs that creep into grant applications, which we think help. You know… innovatively, strikingly, etc. 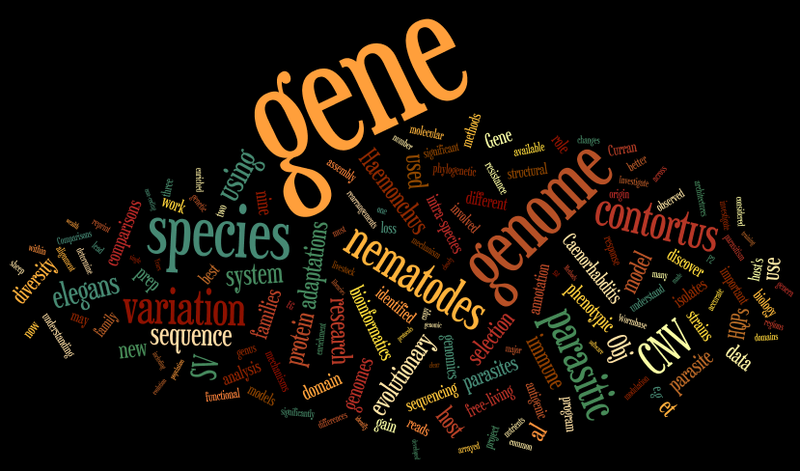 First, back in November, I submitted an application to NSERC (Natural Sciences and Engineering Research Council), entitled: Discovering the role of genome diversity and the molecular basis of parasite adaptations. The decision comes back at the end of March. The second was submitted last week to the CCFC (Crohn’s & Colitis Foundation of Canada). This was not to work with nematodes, rather looking to go beyond the pie-chart to study microbiomes. 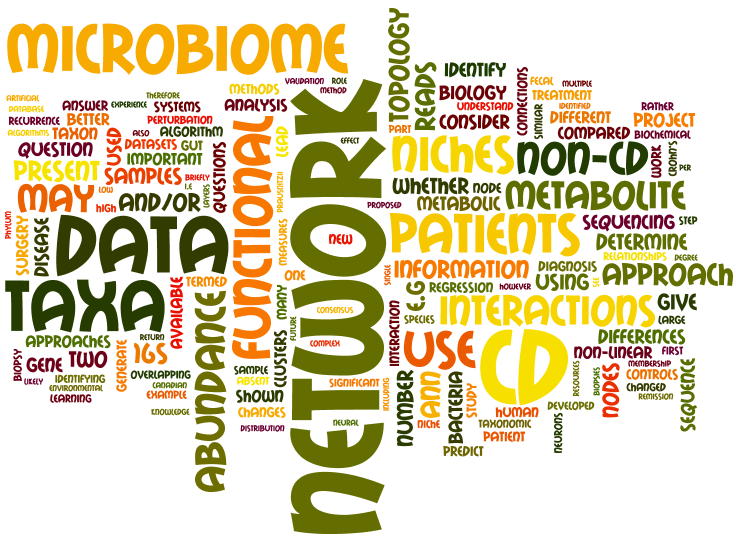 The title is ‘functional analysis of the microbiome of Crohn’s patients to improve diagnosis and treatment.’ This was for an Innovation grant, their word not mine, so I felt that I could justifiably sneak it in a few times. Not sure when I hear back from these folks. Hopefully it’ll be with a cheque.